I called technical support, but haven't heard from them yet. I hadn't needed to print for 2 or 3 weeks. When I fired up the printer, the print jammed and the job aborted. - I cleaned the build table and redid the print layout. This time, I did not use a foundation layer (thinking that perhaps all that foundation was sticking to the pdms). Re-sliced. I don't think this is software. This appears to be mechanical. Perhaps the z motor? Perhaps the motor that slides the vat is getting weak? I don't know how to diagnose this. have you tried using the toggle switch to run the table up and down the z screw and see if it catches or slows at any point? Also does it seem like it got past the attachment layers and actually began building supports or maybe stopped when it was done with the attachment layers and didn't get to the supports? I can use the toggle screws to move up in the z direction and to move the vat right and left. It doesn't appear to be hanging. It WAS hanging just before it jammed. It was having trouble sliding off the pdms. Check to see if u have enough "dam" to allow the printed layer to release. Must have the "cliff" in order to get release of the suction between the PDMS and the last layer printed. I use 60 g of Sylgard to make the pdms. I always have some resin overflow onto the lower vat area after each recoat. You can see the overflow in the pic. A bit harder to see is the pretty dam, but it's there. The printer acts as if it's "forgetting" to raise the z motor the farther the print proceeds. The first few layers slide right off. It gets progressively more difficult the more layers print. hope it hasn't damaged that pretty coating. have you watched during the print to see if the z screw is turning, after the vat slides to release, and then again when vat is returned to the open position? that would confirm the machine "forgetting" to lift. as to how to fix it i'm not sure. I recall a few settings that effect the z screw behavior, such as overlift, dip, and z backlash, I don't know which one will have any effect. 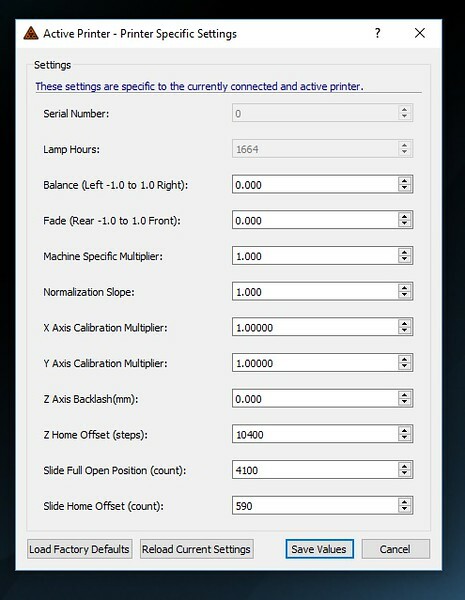 also what z resolution are you slicing and printing? What are u trying to print? Some pics might help. disconnect the usb the computer the power cables to the printer and the projector. reconnect the printer to power and usb the power to the projector and the computer. Thanks, AK. I've done that. No difference. It's still jamming. I've taken a video of the jam, but it's 18 minutes long. I need to edit it a bit so y'all can see it. Sorry about my slow response. I took a video of the machine jamming during a calibration print. 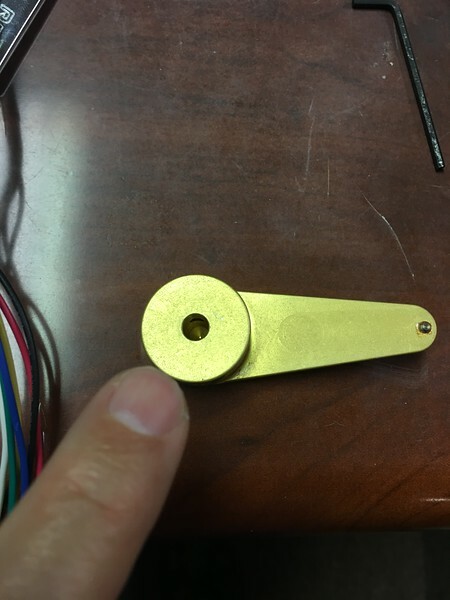 It printed fine for about 13 minutes, then slowly started having trouble releasing off the pdms. It's a long video, and as I don't really know much about video editing / compressing. I sent that video to the good folks at B9 technical support. The consensus was that the printer's mother board was bad. I purchased and installed a new one. But now the printer wouldn't print at all. Of course the board had to be bad. B9 folks suggested I replace the usb and hdmi cables; reluctantly, I did. And it fixed the problem. Could the cables have been the problem all along? I don't know. I don't believe in coincidences, though. Regardless, the printer is working. I'm back in business. I don't have to beg friendly competitors for model printing. And I'm happy. If u can move the vat table and the build table with the toggles then I always recommend checking the cables one at a time. It happened to me before. Cheaper than starting to buy and change parts, not to mention much quicker. In one case it was my bad USB hub, and not the cables. Thanks, Robert. That would have been good advice. Perhaps I spoke too soon. The only cables I had were too short, so I connected another computer to the printer that I could place closer. It printed the job fine, but the vat seemed to be hanging. I quickly ordered another x motor, just in case. They're not that expensive. Today, I put in a fresh vat (not that the other one was worn), as I wanted to start from scratch. Printing the 30xy calibration file, the vat is still dragging. Remember I have a new mother board and new (or, different) cables. I need to print a commercial job tonight, so I'll probably just hang around the printer as the job starts, and manually help the vat move during the early, sticky foundation layers. Let's see. Have u removed the black guide rails and checked for gummy or dried resin? The overnight printed complete. Five rings on the print, but one failed. Sometimes that happens, I suppose. I have no more commercial prints in the que, so I'll probably take the printer apart. Clean rails, play with the existing x-motor, etc. I'll let y'all know what happens. I took the printer apart and cleaned things. Apart from some pdms-looking junk on the bottom of the gold arm, I didn't see much. This pic is, unfortunately, after I cleaned the arm. I had sent off for a new x-motor. It arrived, and I replaced the old one with the new. Installation went smoothly. It's amazing how much smoother this new motor sounds than the old one. I was really hoping it would have fixed the dragging, but it hasn't. The video is a largish file, but if you get a chance, pls look at it. Not how smoothly the vat slides when traveling to a new layer print. But notice how much it seems the motor is straining to slide the vat off the build table. I'm able to get prints off the machine. It just seems that the printer is struggling too much to slide the vat off the build table after a new layer is printed. 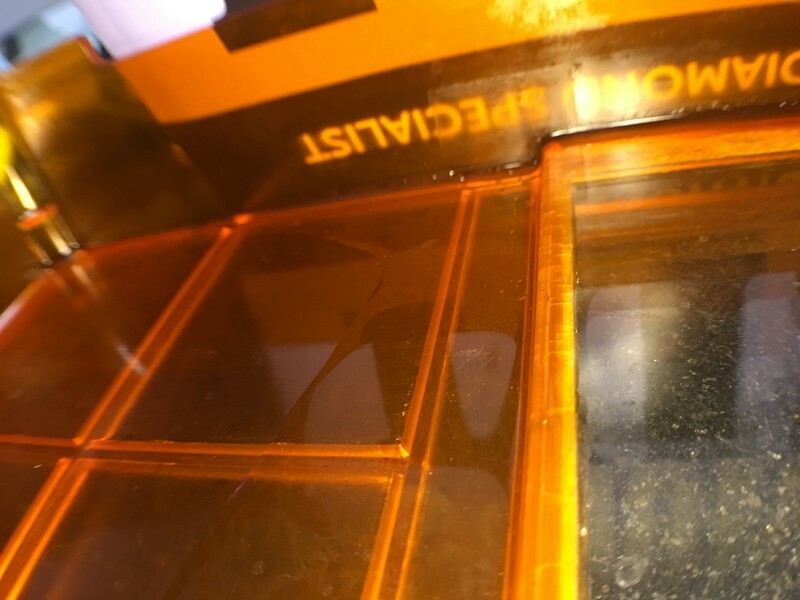 This is affecting the resolution of my prints: it's dragging so much that some of the freshly cured resin off that layer appears to be eroded off. Sounds like you might have the z motor settings set for a different version of the machine. Take a very thin piece of plastic sheet , put it on the tray and recalibrate. The thin plastic will raise your platform just a tiny bit. Remove the plastic sheet after calibrating and try it... It may get rid of the drag and print fine. These are a few things that I have had to do at one point or another. I have never changed cables and cords... even though there are times when I had to unplug and re plug them in. Thanks, Dan. I was headed in the general direction of your advice, but with software. I hadn't considered doing it mechanically, with a thin sheet of plastic. Let me see if I can find some. It would be nice if there was a software "offset" in the printer settings that would raise the build table, say, 0.05 - 0.1 mm after printing.